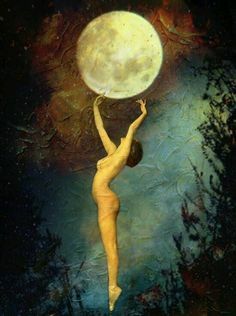 Drawing down the moon is a lovely practice to harness Goddess energy as well as magical properties of the moon herself. This is best done during a full moon and working outside in the full moonlight-this is when the energy is at it's most potent. "Moon and Goddess, lend me your light. to fill myself up with radiance and grace. replenish me energy and refresh my being." Imagine your cup and entire being filling up with the Divine light and energy of the Moon & Goddess herself. Stay for as long as you like, when complete offer your thanks and imagine closing all of your energy channels and holding that new found light into yourself. ​Other tools you can use to draw down the moon are willow wands-Goddess wood that hold the element of the moon and the Goddess herself, orris root, crystal grids with quartz, moonstone and labradorite. Learn more tools of the trade here and see what you want to create for your own modern goddess ritual. You've heard of sun bathing, but have you discovered moon bathing? Whether you sit outside under her light or gaze from your window, moon bathing is a great way to commune with Mother Moon. Gape into her steady grace, her cooling presence. Close your eyes and feel the nourishment of her calming energy as you would feel the nourishment from the warmth of the sun. Connected to the water element, moon bathing can be a powerful practice and ritual to release what no longer serves you when the moon is full or wash away obstacles to set new intentions during the new moon. Whatever your practice, remember that the moon represents Goddess energy, the Divine feminine, cycles of life and the woman's body, our ability to follow the rhythms of nature and illuminate the shadows within ourselves for healing. Stay connected and honor her often, she is always your quiet ally in the sky.